Sparkplug Information- Donations, Registrations and More! The Sparkplug Banquet is almost here! 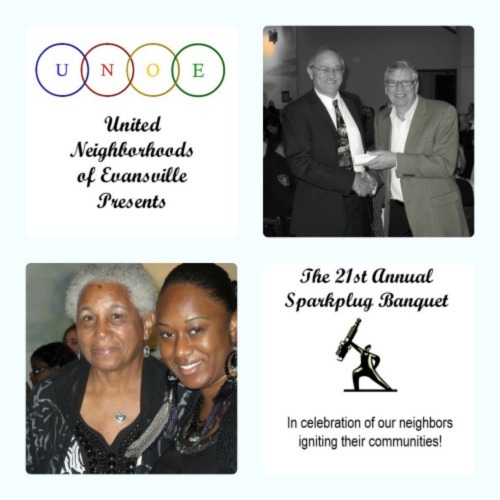 For your convenience we have provided all the forms you need to register for the banquet, nominate a neighborhood “sparkplug,” or donate a door prize! You are free to snail mail or email the forms, but at this time we are not accepting online payments for the banquet. The menu for evening is a choice of glazed chicken with roasted potatoes or eggplant cannelloni with angel hair pasta in a roasted red pepper sauce. All meals include fresh grilled vegetables, seasonal greens, fresh baked bread and bread pudding with a caramel glaze for dessert. Click here to download the form to register your neighborhood. Single registrations are also fine, just mail a check to UNOE or bring cash to the office. This also includes the form to nominate a neighborhood “Sparkplug,” someone who is working hard to ignite the community. If you are a local business who would like to donate a door prize the form can be found here. We appreciate your support! We are still looking for sponsors as well. See this post for information on sponsorship levels. We appreciate everyone who gives back to their community in this way! See you at the Sparkplug Banquet October 27th!